Click here to see this video clip of a baby white tipped dove which I found in the garden yesterday. The way it ends is classic. Thank you, you can keep the change! When the bird in the hand has just shat. 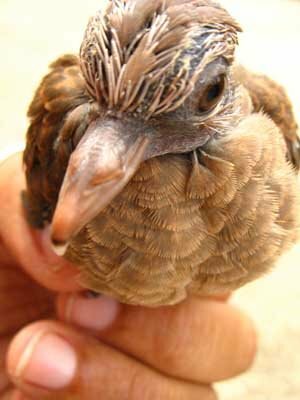 cute.. we almost have a great view of future baby Mourning Doves.. light they built the nest on tipped over and the eggs broke..
Shaking it off your hands was the equivalent of a boy wiping away a girl's kiss. You were meant to close your fingers tightly over it and not wash your hands for a week after. Sheeesh, don't you people know anything about lucky poo?? Beautiful photo, beautiful video. Watching your finger caressing the little baby's back reminded me that I hadn't yet wished you a Happy Mother's Day. For all the dreams that you nurture, all the creations that toddle around your knees until they are strong enough to stand on their own, for your sharing and caring and daring to defend, thank you Mummy Elspeth!! From the anointing to the Happy creative Mother's Day, thanks for the comments. Birdy Nyum Nyums, I don't think the Dove was insulted that I did not embrace her offering at first ... she was persistent and succeeded in giving me a lot more - mainly on my lap and legs. I eventually took her to Detta's (http://nowiswow.blogspot.com/2005/11/and-winner-is.html).